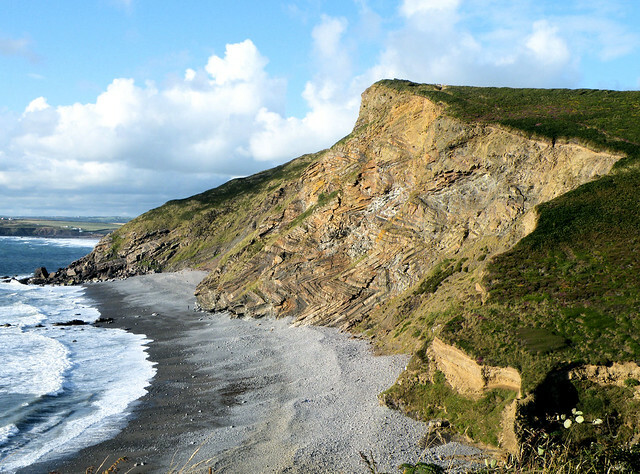 The beaches of North Devon and Cornwall — Hartland Point, Widemouth Bay, Sandymouth Bay — are a walk-though geography lesson. On holiday there last year, I wondered how many generations of schoolchildren have trooped over them on geography fieldtrips to eat sandy sandwiches and half-listen to lectures about longshore drift and the carboniferous geology of the Devonian. To see the waves on the beach rhyming with the frozen waves in the cliffs. 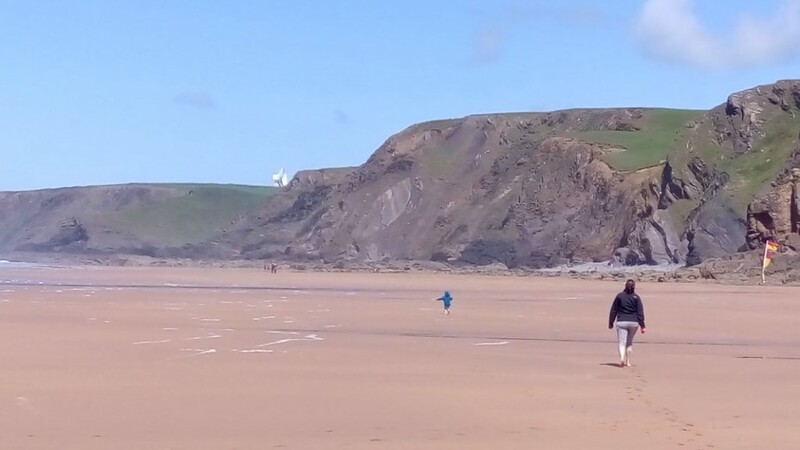 Sitting on the sand at Widemouth Bay, I also wondered if schoolchildren might in the future come to North Devon’s beaches to see a different sort of waves, and a different kind of geography: the physical geography of the internet. Directly under the sand, Widemouth Bay is where eight or more major submarine cables – first for telephone, and now for internet – come ashore, carrying much of the UK’s communications with Europe, the US and West Africa. Set back from the beach, just behind the public toilets, is an inconspicuous shed — it houses a repeater station with an underground bunker built to withstand nuclear attack. The BBC claims that some 25% of internet traffic worldwide passes through Cornwall. Though I’m a little unsure how that’s calculated, a large chunk of that (surely ballpark) figure must come through Widemouth Bay. Which is convenient, because visible from the beach are several vast white satellite dishes poking over the cliffs: GCHQ Bude, a huge joint UK-US communications intercept station. The dishes are its most visible pieces of snooping kit, but these days surely far from its most significant. Edward Snowden’s revelations included the news that GCHQ Bude also intercepts the traffic of the submarine cables that land on this stretch of the coast. Which got me wondering whether this congruence of cable and intercept site is really just fortuitous. GCHQ Bude wasn’t built in its particular location for undersea cables, but for overhead satellites. In 1962 the commercial satellite company Intelsat established what is now one of the world’s largest satellite receiving stations at Goonhilly Downs, about 100km away at the southern tip of Cornwall. As Professor Richard Aldrich tells us in his magisterial history of GCHQ, the downstream link from Intelsat’s satellites could be intercepted by placing receiver dishes in the surrounding “footprint”. The former RAF airfield at Cleave, just above Widemouth Bay, was duly repurposed in 1969 to become what is now GCHQ Bude. The real flurry of cables at Widemouth came afterwards, between 1988 and 2011, with the landing of at least six major cables between the U.S., Europe and West Africa: all optical-fibre, most landed from around 2000 onwards as the internet exploded. Which raises the question: is the listening station (still) there because the cables come ashore there? Or…do the cables come ashore there because the listening station is there? In other words, is the physical geography of the internet to some degree shaped or bent around the shape of the government infrastructure established to monitor it illicitly, and not vice versa? Before we get too conspiratorial: I know nothing about internet surveillance, submarine engineering or the history of telecoms. I imagine the gentle gradient of Widemouth Bay is well-suited to landing submarine cables, and it is after all towards the western end of the UK (though it’s not actually the island’s western promontory, the foot of Cornwall, which is – unsurprisingly — also fairly populated with cable landings). By the time GCHQ Bude was set up in 1969, morover, the earliest submarine cables at Widemouth had already been landed: CANTAT-1, from Canada, arrived in 1961; and AT&T’s TAT-3, joining the UK to the mainland U.S., in 1963. Perhaps once one company has established the landing infrastructure for a cable in one place, other companies use it too? But the map above shows that there are several other convenient places further west where undersea cables — whose length is a key variable increasing their cost and attenuating their signals — can and sometimes have been landed from the west and the south. Why take them all the way round to Widemouth, much further eastward and northward? I genuinely don’t know the answer to this, and would love to be enlightened. The answer, I imagine, lies in meeting minutes and project plans somewhere in the archives of the big transatlantic telecoms companies (AT&T, BT, Cable & Wireless, Alcatel) and in government archives in the U.S, the UK and France. If it’s not still classified (though a surprising amount isn’t, these days). “Commercial and political decision-making in the geography of transatlantic telecommunications, 1961-2015”. There’s surely a Geography PhD in there somewhere? Sounds a bit dull. But surely not as dull as longshore drift.